In Avengers #57, cover date October 1968, one of Marvel Comics' greatest characters debuted. In a plot to destroy the team, Ultron built and programmed an android powerful enough to destroy the team. As the robot attacked them, the Wasp called him an "unearthly, inhuman vision" and a legend was born. The team was able to stop him, and he fought back against his programming and helped the team defeat his "father." An issue later he was challenged by Captain America, Thor and Iron Man in order to join the team, and passed the trio's test. Ever since, he's been one of the greatest and most stalwart members of the team. With his first live-action appearance on the horizon, it's time to look at why the Vision is not just a great Avenger, but perhaps the ultimate Avenger. Now, I'm not making an assertion that the Vision is the greatest Avenger, but the perfect embodiment of what being an Avenger means. Why is that? There are few, if any, superhero teams that have offered a chance at redemption to more characters than the Avengers. Numerous well known Avengers such as Hawkeye, Black Widow, Scarlet Witch, and Quicksilver were all villains prior to joining the team. That's just scratching the surface. However, none of them were specifically created to destroy the Avengers. 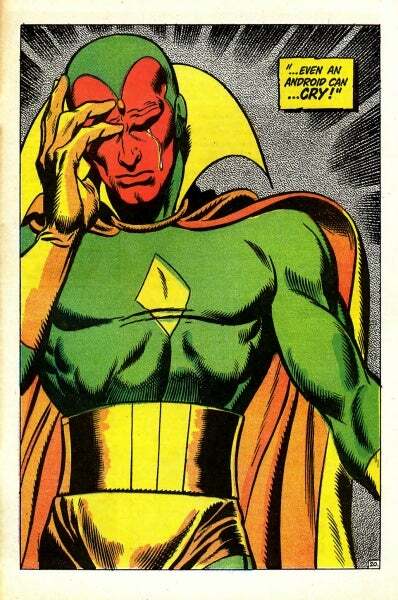 The Vision's entire purpose was to devastate the team, and that makes his betrayal of his father even sharper. Even worse, he almost immediately realized that he was wrong, and asked to join the team. Although he naturally was regarded with skepticism at first, he did win the trust of his teammates and became the Avengers' anchor for years. He had a farther distance to travel in winning that trust as well, as his father was one of their greatest adversaries, which makes his redemption even more impressive. He never stopped fighting for that redemption, and proved himself over and over again. "He was the most human of us all..."
Sure, that (severely paraphrased) quote was about Mister Spock, but it truly applies to the Vision as well. He was always painfully aware of his existence as an artificial being but struggled with being human. He loved music. He adopted a human identity. And he fought to understand his emotions (one in particular I'll talk about in a second). He also struggled with the fact that his synthetic brain was based on his sometimes teammate Simon Williams. He asked whether he was his own individual being, or just a copy of Wonder Man. All of these questions come together after his death, in my opinion, though. During an event called the Chaos War, dozens of dead heroes were brought back from the afterlife. Including the Vision. Could a simple android truly have a soul if he were not human? I don't think so. One of the defining interpersonal relationships of the Avengers was that of the Vision and Scarlet Witch. It was a bizarre pairing on paper. She was a gypsy orphan, who also happened to be the mutant daughter of one of the world's greatest villains. He was a synthetic being that struggled with whether he even could love. They were perfect for each other though. They could take solace from the insanity in their lives in each other's arms. They experienced highs and lows, and their teammates were behind them the whole time. Look at this cover. It might seem strange for me to feature it in an opinion piece about the Vision, because the Vision only features in the trade dress. The thing is, he first appears in the series' header two issues after his debut, and is featured there until issue #92 with the entire current line-up of the team. Then in issue #93, he's there alone up through issue #184- a whopping 91 issues of the series where the company used him and him alone as an icon of the team. No other character was featured solo in the Avengers trade dress until issue #361, when Marvel introduced a trade dress that rotated between individual members of the team for about a year. But the first character they featured in that new trade dress? ...she tore the Vision in two. The loss shook the team to their core, She-Hulk in particular. Hawkeye, another essential Avenger, lost his own life very quickly after. Their sacrifices combined to cause the Avengers to disband for months. Of course, the Vision eventually got better, like characters often do in comics, but for a time his sacrifice drove the team. And if that's not reason enough to call him the living embodiment of the team, what else is?